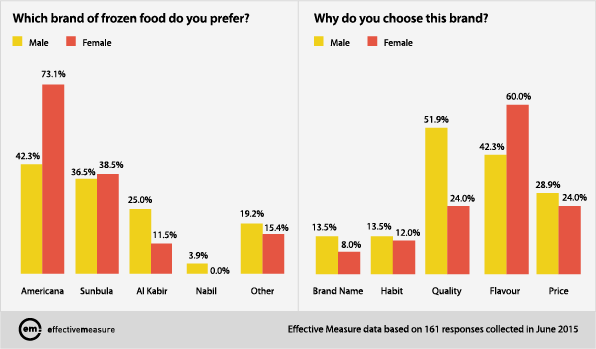 Dubai, UAE, July 16, 2015 – Narratiive (EM), the digital audience profiling and data intelligence solutions provider, has released insights on Saudi Arabian’s frozen food preferences, which indicate that Americana (53 percent) and Sunbula (37 percent) are the frozen food brands of choice, followed by Al Kabir (21 percent). 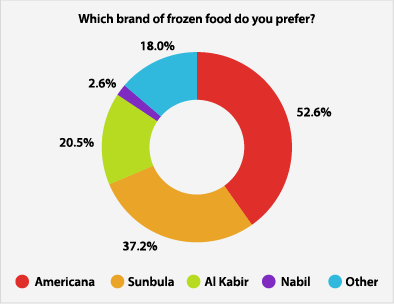 Interestingly, the most recalled frozen food brand advertising among Saudi Arabian respondents was Americana (56 percent) and Sunbula (34 percent) followed by Al Kabir (10 percent) and Nabil (8 percent). In Saudi Arabia, frozen food brands are chosen based on flavour (48 percent) and quality (43 percent). “These results indicate that advertising has a direct impact on brand preferences in Saudi Arabia”, says Frederic Klat, Business Development Manager – GCC, Narratiive. “It’s interesting that women have a much stronger preference toward Americana than males who generally prefer quality over flavour. This could be a result of the Americana advertising,” he said. Other findings from this research indicate that women and men tend to have similar preference for Americana and Sunbula brands. However, when comparing Al Kabir and Nabil, it appears that men have a higher preference to Al Kabir (25 percent compared to women at 12 percent) and a slightly higher preference for Nabil (4 percent compared to 0 percent for women). Women have a much higher preference for Americana (73 percent compared to men at 42 percent). Overall, men prefer quality (52 percent) and women prefer flavour (60 percent). 48 percent of respondents buy or consume frozen food. Of those that don’t buy/consume frozen food the main reasons are: unhealthy (50 percent), unappealing (35 percent) and bad flavour (17 percent). Frozen food is purchased mainly monthly (55 percent). * Findings are based on 161 responses to a flash poll that ran in Saudi Arabia in June 2015.